Fossil Falls is a great opportunity to get out of the car and stretch your legs when driving up Highway 395. This easy trail winds through rough basalt rock for 0.25 miles, eventually ending at the site of an old waterfall. The bedrock of this dry fall has been carved into a swiss cheese pattern by the old river. Look for Red Hill just north of Little Lake on the eastern side of Highway 395. A signed gravel road takes you to a small parking lot with a pit toilet and the trailhead for Fossil Falls. It’s only a quarter mile walk to the dry fall, but it can get really hot due to the full sun exposure and black rock. Prepare yourself with a big drink of water and decent walking shoes. 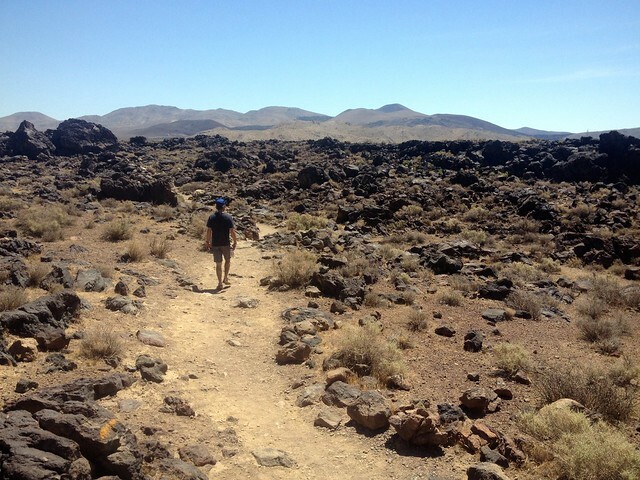 The basalt rock that juts out from the trail to the dry fall was formed by huge lava flows from the Coso Mountains to the east. Red Hill, just to the north, is another trace of the volcanic history this valley experienced. The red rock, called scoria, forms the remaining cinder cone of the old volcano. You will quickly come across the dry fall. As you approach the top of the falls, imagine how water must have braided amongst the many potholes and pools — it was surely a beautiful sight. Explore the dry fall by following the cliff band on either end or by carefully scrambling down into the canyon. The dry fall is made up of two cliffs about two hundred feet apart. Pay special attention to the slippery and uneven rock as you look around. Return to your car by retracing your steps. 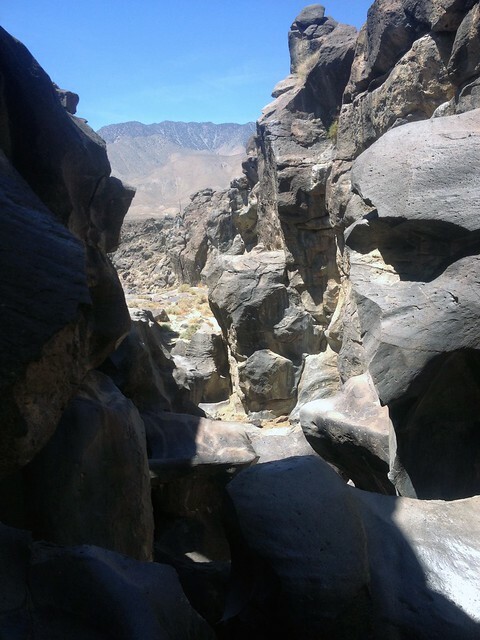 The trail is easy to follow but has large irregular rocks jutting out at random intervals. Be mindful of the steep cliffs surrounding the dry fall. The Fossil Falls BLM is located one-tenth of a mile from the trailhead. There are 11 established sites available as first-come-first-served for $6 per night. Fire rings, pit toilets, picnic tables, and potable water are all available at the campground. 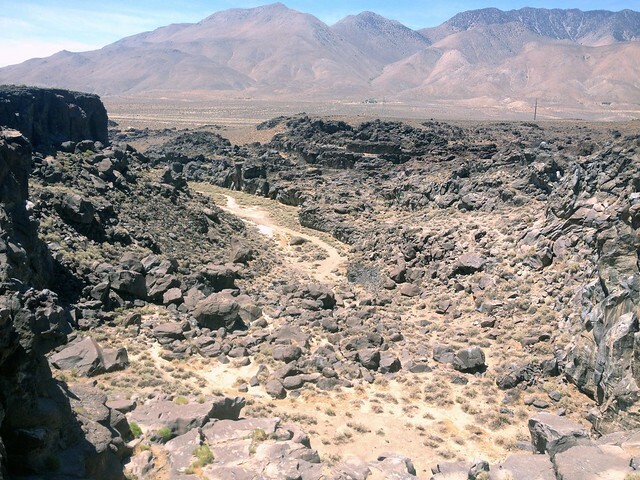 Fossil Falls Scenic Area is located on the southern edge of the Owens Valley, along Highway 395. Look for Red Hill as you landmark, the turnoff is signed just south of the hill. 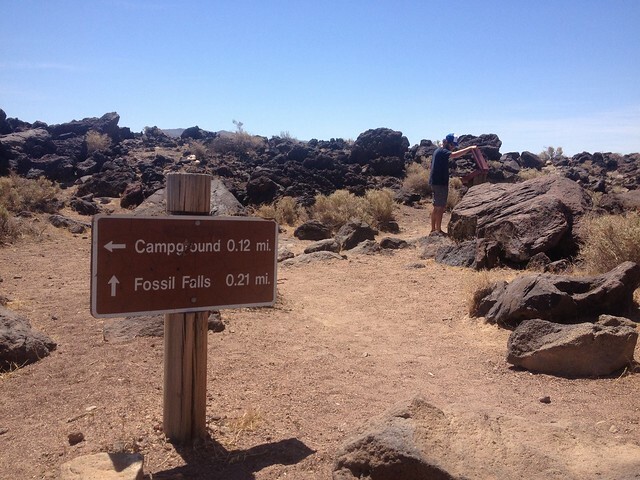 Follow the signs for Fossil Falls trailhead, which is one right hand turn and a short drive down a gravel road.